The game immediately feels familiar for anyone who was a fan of the show or played the NES original. Whether it’s the theme song from the cartoon, the original Scrooge McDuck voice actor, or the ability to tackle the levels in any order (just as in the NES game), this feels like DuckTales and will make any child of the 80s nostalgic. The presentation has certainly been modernized, though, with an initial tutorial level to familiarize players with the controls and extensive voice acting and cut scenes. Unfortunately, these cut scenes and the lengthy dialogue can actually be intrusive. Let’s be frank here: the dialogue and story isn’t exactly Breaking Bad here. While younger players might find it delightful, adults revisiting the classic game will probably quickly choose to skip the cut scenes. As part of the remastering, the graphics have been improves significantly. Scrooge, Huey, Dewey, and Louie, and the enemies are all done in an attractive hand-drawn style that feels like the cartoon. Unfortunately, the levels themselves are done in 3D. Others might disagree, but the 3D seems completely out of keeping with the game as a stylistic choice. Not only that, but probably as a result of trying to make the game suitable for several platforms, the 3D is very basic and feels like the product of a few generations of technology ago. When it comes to gameplay, I’m torn as to how to think. The game is very true to the original—which was known to be punishingly hard (as most platforms were on the NES)—which is both a blessing and a curse. While the original was considered a classic on the NES and the developers of Remastered deserve kudos for preserving much of the original, this does expose the weaknesses of some of these earlier games. Even on easy, the levels can be quite difficult and the difficulty often doesn’t feel grounded in good design, but rather achieved through cheap obstacles that only create frustration. The levels are also very long, adding to the frustration when multiple attempts are needed to complete them. Compared to the quick, almost arcade-like levels of Rayman Adventures (reviewed here), it can feel like a chore playing DuckTales. 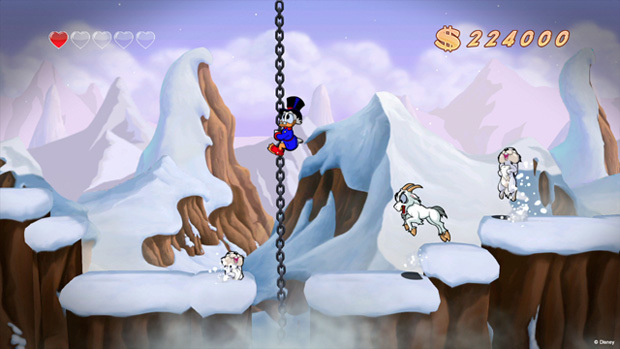 Related to this difficulty is the game controls. Perhaps unsurprisingly, DuckTales: Remastered controls like an old game. In a world where games have elaborate physics systems and controls have evolved to allow players to feel a connection between those physics and the controller, DuckTales feels a bit like operating a poorly-maintained crane machine at a movie theater. There’s no crispness to the controls and it sometimes just feels like dumb luck that Scrooge is actually doing what you want. Overall, I can’t recommend this game after a few hours of play. While it’s a fun trip down memory lane, this feels like that bit of nostalgia that isn’t quite reinvented enough to be good in a modern context, but has been changed too much to enjoy for its history.